Modular and Mobile Home Sales at Glens Falls Custom Modular Homes. 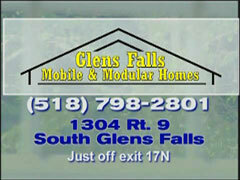 At Glens Falls Custom Modular Homes we don’t just sell you a home to live in. We help to create the perfect modular home for you and your family. Custom designs to meet your needs are our specialty. We do this by offering many sevices to make your home buying experience as easy as possible. With many home manufacturers and thousands of floor plans available, we want to help you feel comfortable and confident in your Modular Home decision. We display many modular homes at our sales center. We are located off Exit 17N from the Adirondack Northway (I-87), Rte 9 North, 1000 yards on right. Or give us a call at (518) 798-2801. We can take care of the delivery and set-up of your new modular home with our own crew. Do you have modular home questions? Click Here! Our modular home delivery, set-up and service people have been certified by the NY Housing Association and the State of New York. Their combined experiences span 30 years of modular home installation.